I came across this young lady while strolling downtown on a warm, summer night. I stopped to listen…. 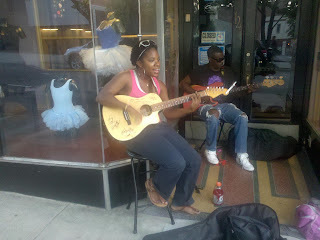 LYRIC and her Father playing in downtown Asheville. I am Leeda September Jones A.K.A. Lyric. I was born and raised in the City of Asheville, NC. As a young child I began my love for music, although I didn’t really understand it until around the age of 12. My grandfather was the “founder” of musicians in my family. He was known as “Guitar Shorty”, the baddest guitar player/singer in the area. Shortly after him, my father, David Matthews A.K.A. P-Funk emerged. He also became a well known musician in our city. When I was a child he would sing to me, teaching me the words, and I would sing along. Little did he know, I was soaking it all in so that when my turn came, I too could be an awesome singer, songwriter and musician. He played a great part in training my ear, allowing me to easily pick out parts and melodies in songs. As a teenager in middle school, music began to flourish in my life. I joined the Asheville Middle School choir, where I was encouraged to put my heart into and lead almost every song we sang. It was in middle school where I began to write songs and poems. During my high school years I joined the Asheville High School Women’s Choir. Singing in the choir introduced me to a new style of music singing songs like In the Bleak Mid Winter, the Alma Matta and Seasons of Love from the RENT soundtrack. I also took a musical theatre class which introduced me to singing, dancing and acting in a single act. It was during my college days that the lyrics of India Arie inspired me. I got emerged in her tones and lyrics, and my style became similar to hers. With Jesus Christ as my foundation, I have now become a “Lyric.” I enjoy writing and singing songs concerning my feelings/mental state, or encouraging songs about everyday life. Attending Western Carolina University expanded my interest and skills in music in a way that I never expected. For the first time in my life I was exposed to reading music, vocal/oral training and piano classes. I also joined the inspirational choir which enable me to share my gift and become a musical role model for others. The journey continued when I won 1st place in the River of Life’s “Asheville’s Gospels Best” competition. 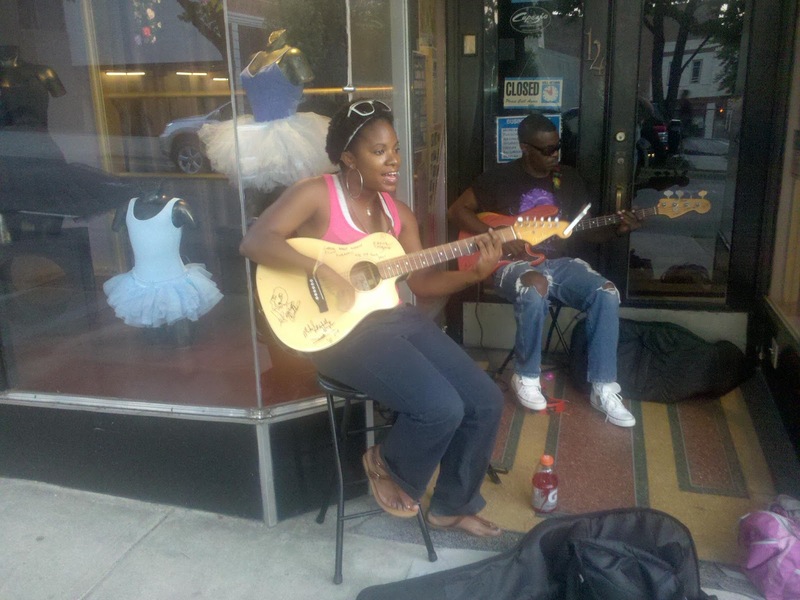 I started to really become noticed when I took my music to the streets… “Busking, Playing and singing for tips in Downtown Asheville, NC. This opened my eyes up to a whole new world of music and has expanded my fan base tremendously!! My goal in life is to impact nations and generations through the music of Lyric.